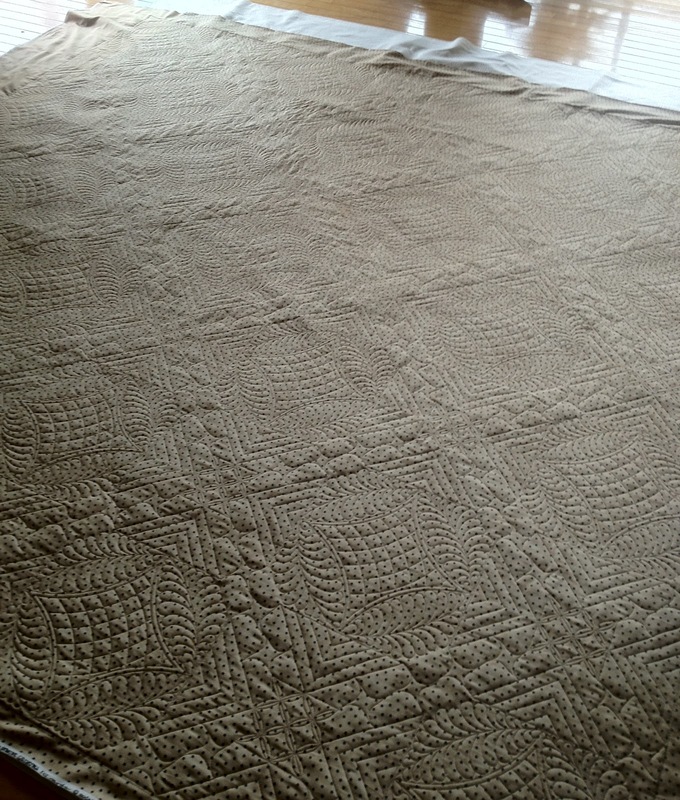 More gorgeous quilting on wonderful quilts - you and Lisa make a great team! Linda, your post could never be too long. What a fantastic job you did on LB's Midnite Harvest. 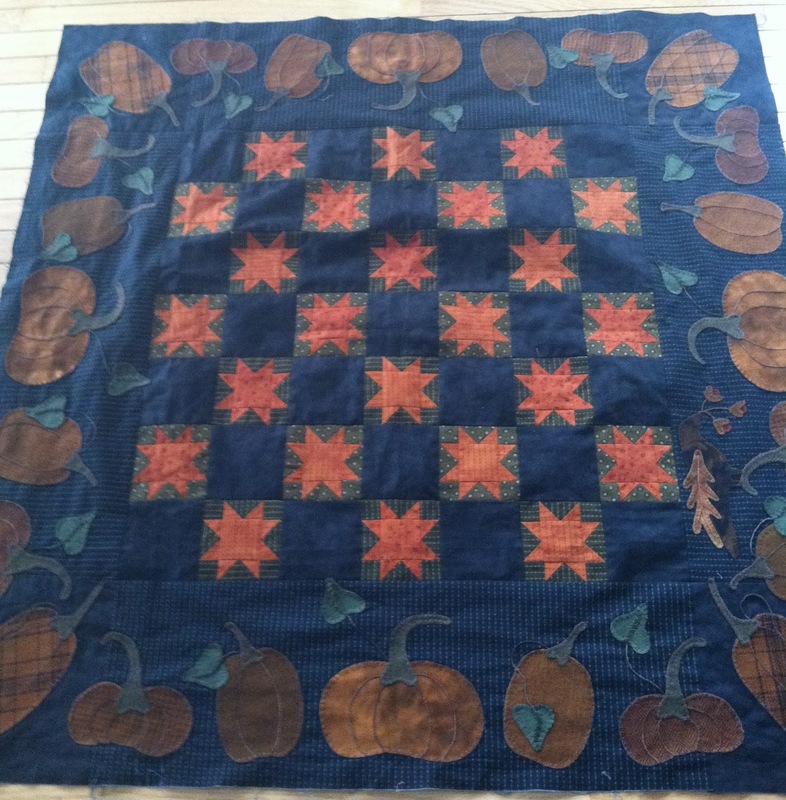 Just wondering if you quilt around or on the wool pieces? 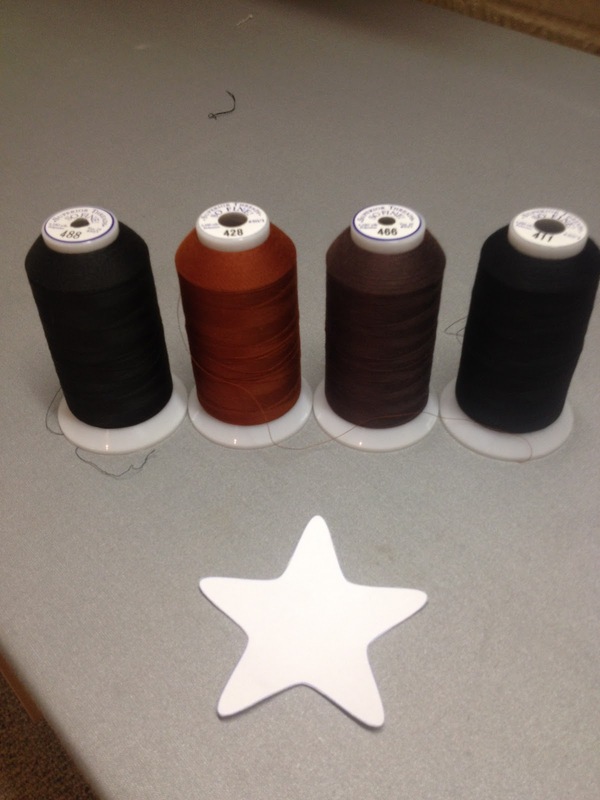 you're quilting is stellar. How exciting to have it displayed at Market...just the beginning for you I think. L.O.V.E the back peek at Colfax County-wow. Beautiful, Linda. 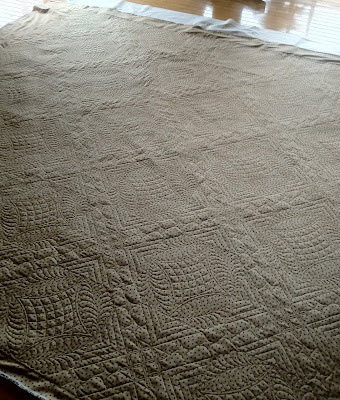 Your quilting is truly artwork! 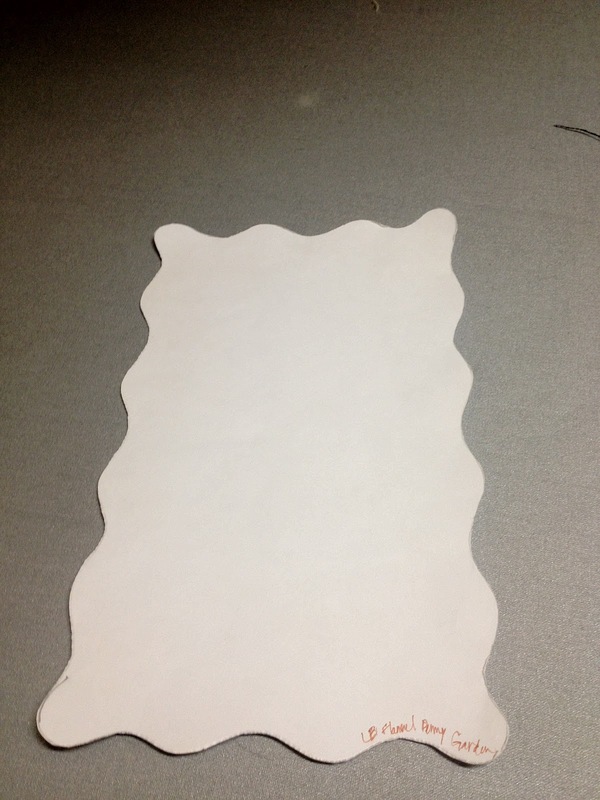 You also "hit it out of the ballpark" with your quilting on this one! Great job! 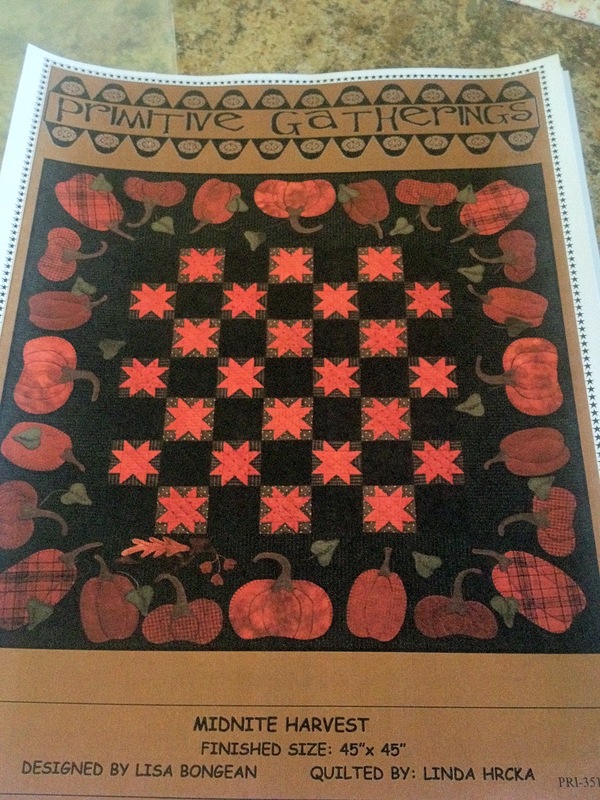 Your work is amazing...I'm sure that quilt will be on display at the quilt fair in Long Beach this year and since Primitive Gatherings is one of my favorite booths...I will be sure to check it out in person...fabulous job!! 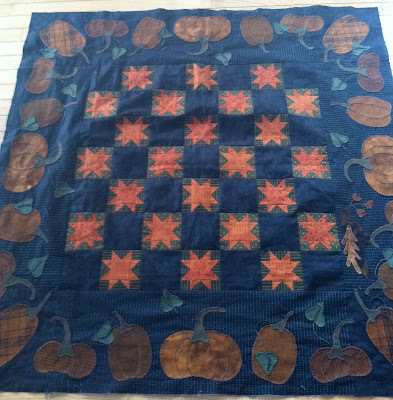 Really gorgeous work on the pumpkin quilt!! Just gorgeous! Your quilting has always amazed me ! Never, ever enough pics on here girl, lol - I love looking at your quilting, it just fascinates me!!! You are such an artist! Oh my goodness that is just amazing. I LOVE the stars in the black squares, so perfect. And the back of the other quilt - even more amazing!! How do you do it? Can't wait to see the front of that one. 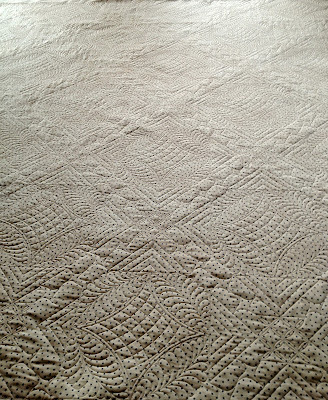 Love this quilt and your quilting just "makes" it! You are so talented. I can't wait to see the next quilt too! Glad you rested for Mother's Day! Once again your quilting makes the quilt! How wonderful that your husband offered to draw all the stars!! Beautiful quilting Linda, and the Colfax County quilt looks amazing from the back...what a tease! You have out done yourself again! This is Gorgeous! They are all Gorgeous! Beautiful! 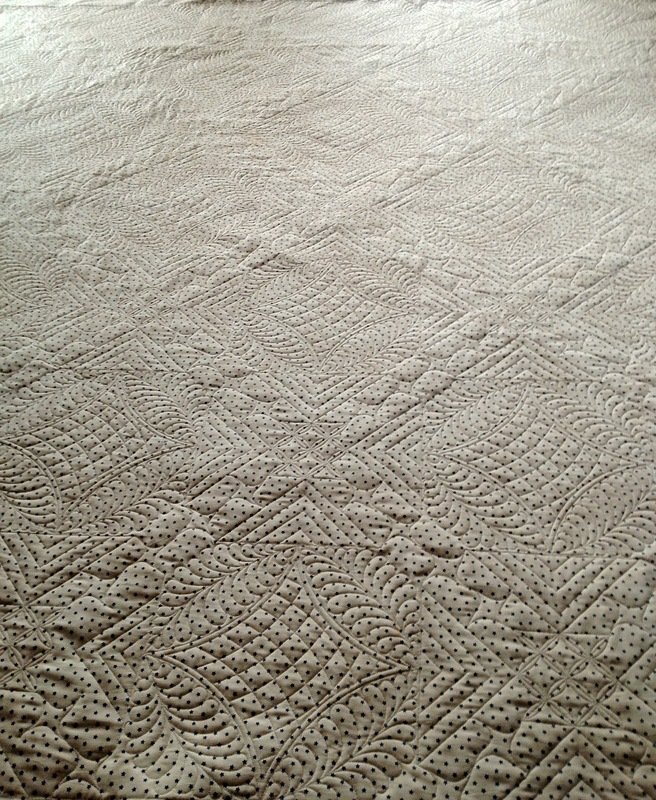 I love to look at your quilting. 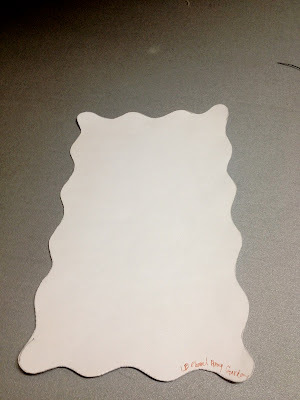 When you use the templates, do you draw them on with water soluble pen and then just trace around them with your machine? Love the echo swirl quilting around the pumpkins. Thanks for sharing. The quilt is the cutest thing ever.. but your quilting is over the top drop dead gorgeous Linda! Who wouldn't be tickled pink with this! Fabulous quilting!! I love the stars in the solid blocks. Linda, am I ever so glad you emailed me :-) What beautiful work!!! I absolutely LOVE this quilt!!!! I am adding you to my blog roll. Your quilting just adds that extra something to these quilts. Great to see your name on the pattern, too! Yes, you definitely should have come, and it's definitely cool that you have your name on a pattern. So awesome! Way to go!! !